The Romanian brewer United Romanian Breweries Bereprod (Tuborg Romania) has launched a new website for their environmental initiative “Green Umbrella” Campaign, realized by Selenis. The agency was in charge of the research, marketing strategy development, information architecture, graphic design, front and back-end development, and content creation for the website (www.umbrelaverde.ro). We also managed the PR campaign for the launch, including bloggers’ engagement. The website is designed for a young audience, bloggers and social media influencers, that care for the environment and resonates with the campaign’s slogan – “Keep Romania clean!”. The aim of the launching project was to engage the Romanian online community in a lively conversation about the environment and the “Green Umbrella” ways of helping. an interactive rich blog for Tuborg Romania’s representative to interact with the community. The project is not the first collaboration between Selenis and Tuborg Romania. In December 2007, our agency realized an online pressroom for the company. Today, the pressroom is used by over 130 journalists and bloggers to receive company’s news and research their articles. In less than one year we convinced more than 1.000 Romanian bloggers to join the campaign, we had more than 40.000 environmental car stickers distributed and a weekly website traffic of more than 10.000 unique users. 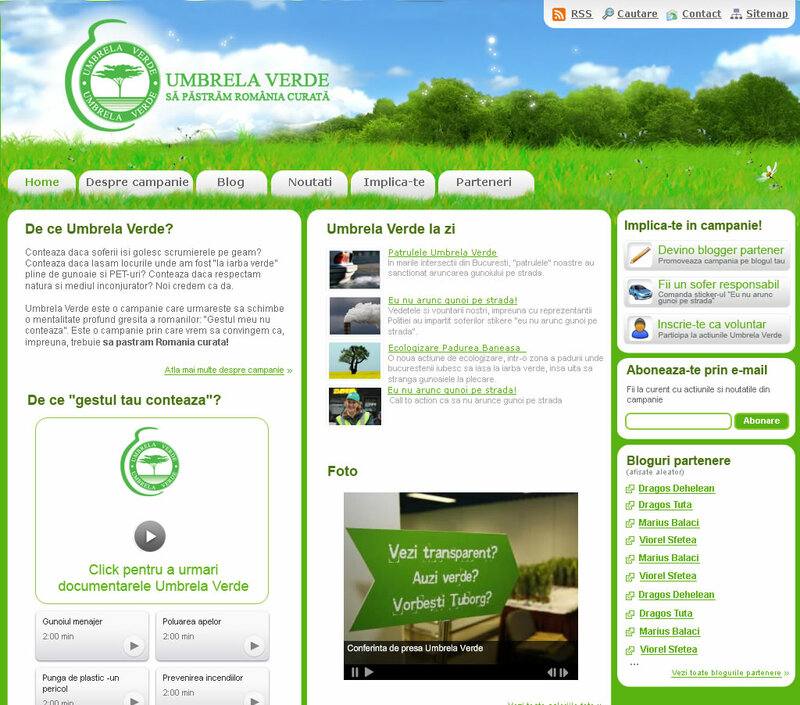 “Umbrela Verde” online platform ranked no 1 for two years in a row (2009 and 2010) in the national top of Romanian blogs (Zelist). United Romanian Breweries Bereprod (URBB), known as Tuborg Romania, is a Romanian producer and importer of beer and soft drinks. The company entered the Romanian market in 1994 and has invested since then more than 185 billion USD. The company’s portfolio is formed only by international premium brands: Tuborg, Tuborg Strong, Tuborg Christmas Brew, Holsten, Carlsberg, Skol, Guinness, Kilkenny, Orangina, and Granini. The company has more than 950 employees in Romania. “Umbrela Verde” is an environmental CSR campaign, launched by Tuborg Romania in the summer of 2007. The main goals of the campaign are 1) to change the misguided Romanians’ mentality that “our actions are too small to make a difference” and 2) to convince Romanians that together we must keep Romania clean. The campaign has a yearly calendar of public volunteering events, concerts, and educational multimedia initiatives.